Noting "remarkable interest" in the 500byGucci, which generated 3,000 pre-orders, Fiat has revealed the 500CbyGucci edition. The city-car is offered in both metallic black or white paint and features a unique canvas top, dual-coloured Frau leather upholstery, 16” alloy wheels, external chrome highlights, unique badging, bi-xenon headlights, Blue&Me, and 50/50 spilt-folding rear seats. 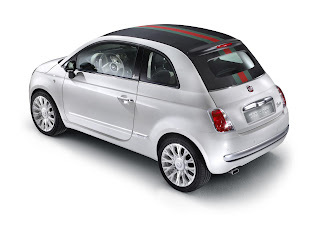 Fiat will begin taking orders later this month with prices starting at €20,000. On the wave of the remarkable interest attracted by "500 by Gucci" - 3000 pre-orders logged on the www.500bygucci.com website and requests from all over the world - Fiat and Gucci introduce the "500C by Gucci", a cabriolet version once again customised by Gucci Creative Director Frida Giannini in collaboration with the Centro Stile Fiat. Orders will start in August. The car will be distributed worldwide and from September will be on display in selected Italian Fiat showrooms. It will have a price tag of 20,000 euros. Furthermore, as from 19 August, "500C by Gucci" will be the star of an original tour that will stop at some of the most famous places in Europe. All the exclusivity of the "500 by Gucci" - attention to detail, feeling of elegance and style - is enhanced in this new version, and made even more attractive by the innovative electric soft top for opening a "window onto the sky". The new convertible version will be available in two sophisticated body colours: white with matte chrome-plated elements and glossy black with shiny chrome-plated accents. For both, the soft top is black with the characteristic green-red-green Gucci web pattern printed lengthwise (the same graphic pattern is sported on the side of the car). Furthermore, the side pillars of the saloon version are maintained and with its special sliding electric top the Fiat "500C by Gucci" can be enjoyed all year round. 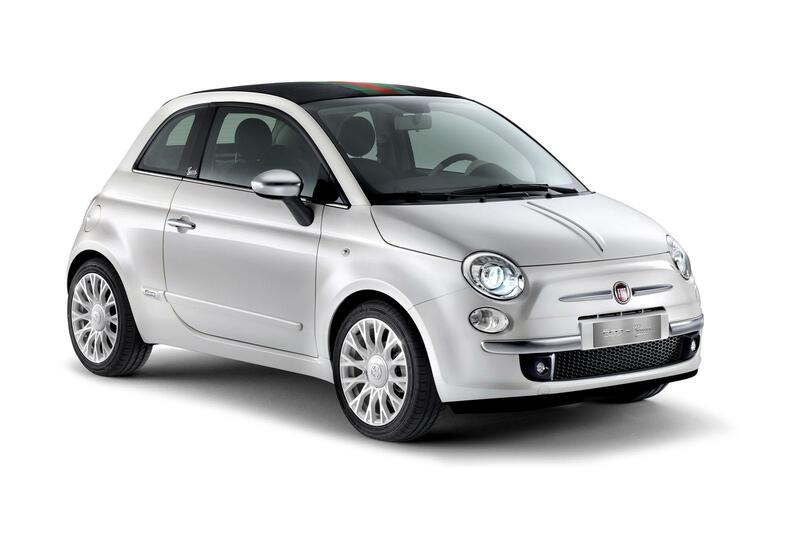 The exterior of the Fiat "500C by Gucci" is embellished by 16" alloy wheels characterised by the unmistakable retro design of the spokes, in perfect harmony with the exterior colours: an absolute first for cars in this category. The hub caps have a double "G" logo in matching body colour and the Gucci signature in italics is displayed on the tailgate and on the door pillar. The passenger compartment of the Fiat 500 by Gucci also brims with style: stylish stitching, exclusive materials, satin and polished chrome-plated elements, a velvet-effect finish on the radio panel and two-tone Frau leather seats with Guccissima print. The "Gucci" web theme also appears on the seats, gearbox, key cover, mats and, with an innovative finish, on the seat belts. Fiat "500C by Gucci" will of course come complete with a great deal of standard equipment: automatic climate control system, seven airbags (front, side, window and knee), Blue&Me system integrated with rear parking sensors, car radio with CD-MP3 player and leather steering wheel with radio controls. Before debuting in showrooms in August the "500C by Gucci" will be the star of an original tour that will stop at some of the most charming locations in Europe. The first stop will be at Saint Tropez (from19 to 27 August) followed by Berlin (8 - 14 September), Barcelona (25 September - 2 October), London (16 - 23 October) and Geneva (23 - 30 October). In Italy, the tour will start from Forte dei Marmi (22 - 28 August) and then reach Rome (4 - 11 September), Florence (19 - 26 September) and Milan (8 - 16 October). A striking 5-by-5 metre crystal cube with elegant shiny black lacquered bottom and top will be set up for each stage of the tour. Inside, set like a precious jewel, an example of the exclusive cabriolet will be on show. At night, the installation will light up creating a suggestive atmosphere that will further enhance the elegant car and the prestigious location. The stage is completed by three small showcases displaying some of the articles in the "500 by Gucci" collection, which comprises travel accessories, small leather goods, track suits, bomber jackets, driving gloves, eyewear and a watch.